Halloween is on Thursday, a favorite day of the year for people who like to wear costumes, and for people that like to see people in costume. Lot's of people wore their costumes last weekend for parties and such. Good for you! But then the day after Halloween you have to put that costume you worked so hard on away and maybe never wear it again. 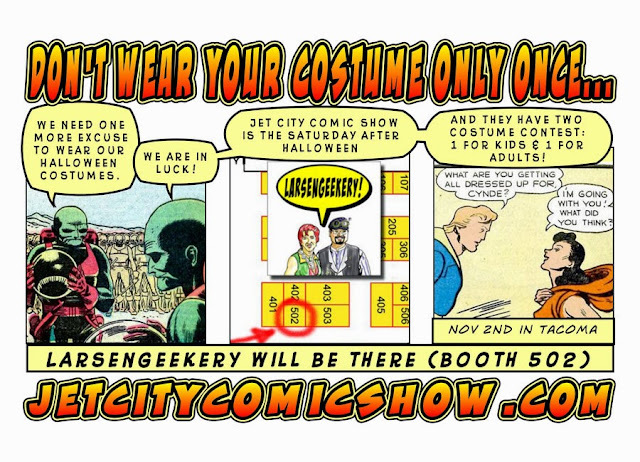 The Saturday after Halloween, November 2nd is Jet City Comic Show in Tacoma. The Larsens will be there in Booth 502. Just look for the LARSENGEEKERY banner. What will Evelyn and Jay be dressed up as? Well, you will have to come to the show to find out. Wear your costume. Enter the costume contest. Have your picture taken with Heroes for Causes or the Star Wars 501st. Check out all the other peoples' costumes. Buy incredible comic book stuff and Geek Gear from the terrific vendors and artists. Meet famous authors. There is a lot to see and do at this one-day show. And it is only $8 bucks to get in. You can afford to bring the whole family. Veterans and Active-duty military can get free passes. And check out the full list of programming. In the meantime, Sign Up for our LarsenGeekery Mailing List. Get valuable coupons. Visit our LarsenGeekery Store. Buy Geeky Stuff and support local artists.